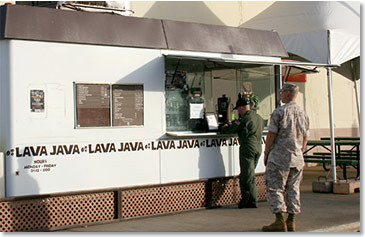 The Lava Java coffee cart is conveniently located outside the base theater, providing various beverages and options for a quick bite to-go. Lava Java’s breakfast and lunch menu features items made fresh in the kitchen at Kahuna’s Sports Bar & Grill – soups, breakfast burritos, hot dogs, and fresh-baked muffins and brownies. Whatever you’re craving, our staff will greet you with warmth and aloha and even suggest a great drink pairing. A visit to Lava Java and our pleasant staff are sure to brighten your day! View the Lava Java menu.